From where should I start. Seven Day Queen was beautiful in every aspect. Labeled as Korea Romeo and Juliet, real life King Jungjong and Queen Dangyeong truly had one tragic love. I think drama did extremely great in retelling their painful love story. Proven by me who cried a river while watching. Drama also successfully recreated the tension between King Jungjong and Yeonsangun. As you’ve probably read on the internet, the relationship between the two was awful. The opening scene was heart dropping. I almost lost my heart thinking that at the end Shin Chae Kyung (played by Park Min Young) would be executed. One of the most dramatic opening scenes in kdramaland. 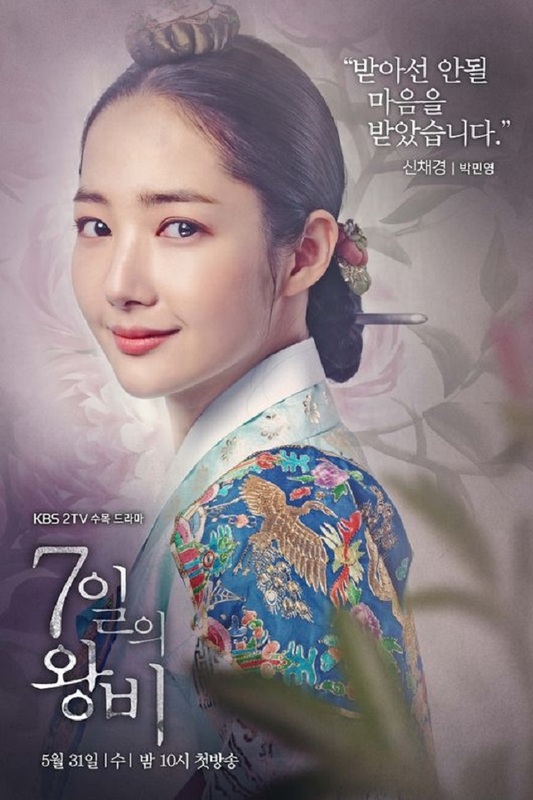 The story then introduced us to the young characters, playful Crown Prince Jin Seong (played by Baek Seung Hwan), cold-hearted Yeonsangun (played by Lee Dong Gun), and sweet hearted Shin Chae Kyung(played by Park Si Eun). The story got more playful with Crown Prince Jin Seong and Shin Chae Kyung encounter. What I liked from drama as a whole is, at the first quarter they could balance the comedy and serious aspect and that’s why the drama didn’t feel that heavy. But as the story progressed the plot got heavier and heavier. The transition from semi-heavy to extremely-heavy was done gracefully. It did not shock you that the plot suddenly got all serious and tearjerker. You kinda know that it would eventually become heavy and dark. Drama built up their base foundation with the young characters. I cannot say anything other than, they did it extremely well. The foundation built up was really strong that when they did transition to the adult characters it was really natural. The introduction of the adult characters (ep 4) was done playfully too. That way we could see glimpses of their young selves and not feeling so strange with the new characters. The love triangle that did not happen in real life, was written in the most painful way ever possible. At some point it was really frustrating because I just wanted Shin Chae Kyung to be happy but I knew that she wouldn’t be happy until the end. I seriously felt exhausted watching Shin Chae Kyung being all sad which is actually not a bad thing at all. It means the story was clever. I truly pitied Shin Chae Kyung who must faced all those bad things only to love. What Chae Kyung and Yeok faced in order to love was overwhelming. I cried a river every time their love was challenged. Buttttt, the romance was on point. It was not overly sweet nor lacking, it was just at the right amount. When they were still newlywed they were extremely cuteeee. In ep 12, when Yeok (the adult counterpart played by Yeon Woo Jin) came home to reconcile with Chae Kyung (the adult counterpart played by Park Min Young) after leaving her right after their marriage was both funny and sad. Then followed up by their dinner scene, Park Min Yeong’s facial expression did a great job. She had a poker face the entire scene! The drama did focus on several things at the same time. For example, there was time when the King was desperately looking for the secret document, at the same time Yeok and Chae Kyung marriage happened. It did feel overwhelming because there were many things going on at the same time. Yeon Woo Jin was extremely great! The last project of his that I watched was Arang and Magistrate (which btw was 5 or 6 years ago) and he did not leave much impression at that time because his presence was really insignificant?? I did not even know he was this great. He truly shocked me in this drama. His acting was solid from start to finish. Not even one scene he was awkward or lacking. Park Min Young. She was constantly criticized for her acting and I agreed with it several times. But in this drama Park Min Young really shone. Not only she did give it all her best, she basically nailed every scene. Lee Dong Gun. There were several scenes where he went a bit overboard for me but overall he was extremely great in portraying a hateful and jealous king. Can we take a moment to appreciate the gorgeous costumes in this drama? No dramas so far come close to Jang Ok Jung, Lives In Love (SBS, 2013) in term of costumes but Seven Day Queen costumes especially for men were gorgeous. As I said earlier, drama was based on real life character, Yeonsangun, King Jungjong, and Queen Dangyeong. But there were several points that were 100% fabricated to spice up the plot. Firstly, the love triangle was fiction. Secondly, unlike in the drama, King Jungjong did not take part at all at the rebellion. Drama did omit one of the famous parts of King Jungjong and Queen Dangyeong’s tragic love story. Queen Dangyeong was exiled to Mt. Inwang and King Jungjong would look mournfully at Mt. Inwang. To let King Jungjong know that she was well and fine, Queen hung the red skirt she used to wear during her days as Queen on a rock. Knetizens did point this out and expressed their disappointment that drama omitted that detail. I, am too, disappointed that such fact was not included in the drama. Yknow, to make things more dramatic. Drama did include the folktale of the two meeting in secret when King Jungjong was on his deathbed at the age of 56. If you can understand Indonesian and are curious or just want read further information about Yeonsangun, King Jungjong, and their queens concubines (and other Kings of Joseon), you can go to this link -> http://deleigeven.blogspot.co.id/2014/05/dinasti-joseon-waktu-dan-peristiwa-masa.html?m=1. One great reading even though it’s painfully long ahahah. Or, you can read this article if you want more information about Queen Dangyeong here -> https://www.historyofroyalwomen.com/dangyeong/queen-dangyeong-seven-day-queen/. King Jungjong and Queen Dangyeong were truly the Korea Romeo and Juliet. Their painful love story was retold beautifully in Seven Day Queen. Therefore, I give it a solid 10 out of 10. Previous Dispatch’s New Couple Next Son Ye Jin is back!!! !